1. Combine the olive oil and onions in a medium Dutch oven and cook over medium heat, stirring occasionally, for 5 minutes. Add the leeks and garlic, then cover and cook, stirring occasionally, until the leeks are tender, about 15 minutes. Pour in the wine and cook, uncovered, until the alcohol has evaporated, about 15 minutes. Add the broth and the bay leaves and bring to a simmer; continue simmering for 10 minutes. Remove the bay leaves. Puree 2 cups of the soup in a blender and then stir it back into the pot. 2. In a large nonstick skillet, cook the prosciutto over medium-high heat, stirring, just until brown; transfer the prosciutto to the soup and reserve the skillet. 3. Melt 2 tablespoons of the butter in the same skillet over medium heat. Add half of the baguette slices to the skillet and cook until golden and toasted on the bottom, about 4 minutes. Turn the baguette slices over and spoon a heaping tablespoon of the shredded cheese on top of each; cover with a lid and cook until the cheese is melted, 2 to 3 minutes more. Transfer the croutons to a heatproof plate and keep warm in a low oven; repeat with the remaining butter, bread and cheese. 4. Season the soup with salt and pepper, add the chives and ladle into mugs. 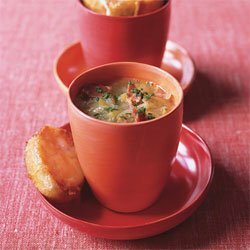 Place a crouton on top of each mug and another on the side and serve.